Hey, Edmonton beer lovers! Join us for a Sudsy Soirée on March 9 to experience a mini festival-style beer tasting event. We’ll have at least 25 beers from six of Edmonton’s most prolific brewers and importers here for you to sample their newest and most popular brews! For only $25 you’ll be treated to some amazing suds, music, tasty snacks, and even raffles and door prizes. Oh, and did we mention a 10% discount on all beers that evening for attendees? And if that’s not enough to entice you – all proceeds from the festival are being donated to the Alzheimer Society of Alberta and Northwest Territories! Chad, one of deVine’s own, has a father-in-law living with dementia. So he’s playing hockey in the Alzheimer Society’s Face Off pro-am hockey tournament with and against former NHL players to raise money to help find cure for dementia, and provide support for patients and families living with it today. 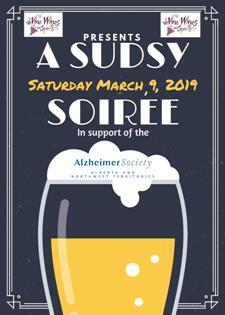 He put together his passion for great craft beer and his need to help people like his father-in-law, and is hosting this sudsy event to help him reach his goal! We’re so fortunate to work with these amazing suppliers and brewers who are passionate about supporting their communities – their contributions, along with your support, makes these events happen. Register online here… Space is limited to sixty people, so book early! This is one Soirée you won’t want to miss!